Do you have any vintage furniture laying around that you are attached to but aren't sure how to work them into your home? I have a few pieces that I love because of the place they've had in my family but I probably would never have chosen them in a store. So how do I work them into my modern beach cottage style? I love these 70's end tables. They're big, clunky, super sturdy, and beat up. I grew up having these around the house and jumped at the chance to have them when my mom offered. I think these things could survive an apocalypse. Like cockroaches. They certainly survived my family of 6 kids. We used them to eat on, sit on, set our drinks down without coasters, you name it. Now they are surviving my kids and our many house guests quite beautifully. A designer may never have put them in our living room, but I love them and they put up with a ton of abuse. I would never get rid of them. 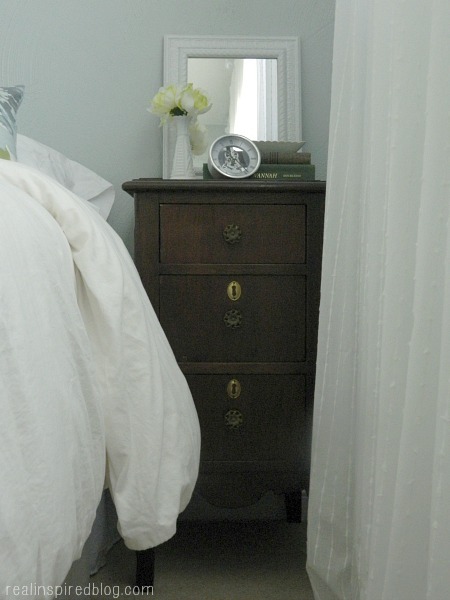 I recently moved our guest room around and I put this antique night stand in there. We bought this and the entire set that it matches, with a dresser and two twin bed frames, from some friends-that-might-as-well-be-family. The set had been passed down through her family and she had recently re-stained them. I fell in love. So far, this is the only piece that has found a home in our house. The rest of the set is patiently waiting in the shed. The dresser in our guest room. This mid-century dresser belonged to my dad's parents. I recently gave it a new coat of paint and replaced the knobs, since it was pretty beat up and one of the knobs was missing. Yes, it's in the same room with the antique nightstand. In our bedroom, I mixed this chippy painted dresser with a modern gray patterned duvet set, modern orb lamps, and herringbone lampshades. The dresser really isn't vintage, but it looks like something you could find at an antique flea market so I'll include it as an example. I really love mixing modern and vintage in design. Unexpected pairings add interest and character. And I get to actually use old furniture that's special to me instead of letting it sit in the shed or getting rid of it. 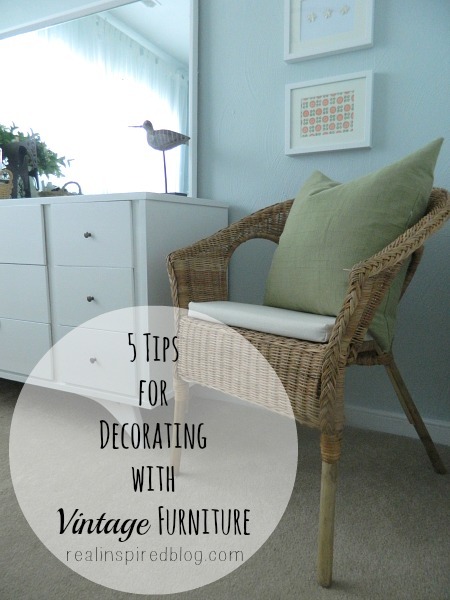 I've put together a list of 5 tips for using vintage furniture in your home. Sometimes all it takes to give a piece new life is to change out the hardware. Or you could even paint the old hardware. Make it look more your style with this cheap, easy trick. I love my end tables as they are, but the dresser got new white paint and the nightstand was re-stained. Sometimes you just have to take the chance and make a big mess! You can always redo it again! One of the resources I checked when I was redoing the dresser was One King's Lane New Home Décor Resource. They have some great information on different types of furniture and decor ideas. I was able to get some info on the mid-century design and get some other ideas too! Redoing something may take some time, but it will be worth it to have a piece you will actually love and use. Which brings me to number 3. 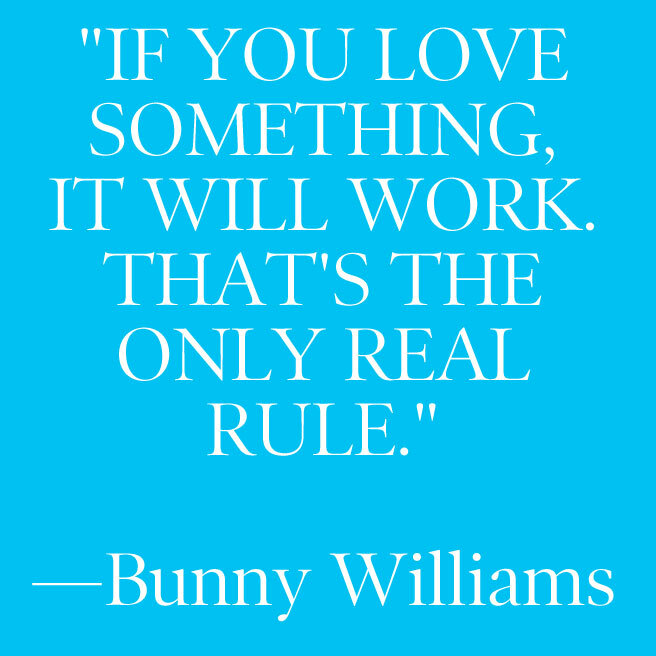 If you don't love it, it won't work. Simple as that. Too many people are afraid of really using their old things. I understand that no one wants to ruin something that is old or important to them but, when it comes down to it, these things are just that. Things. Use your "things" with confidence and make them a loved part of your home, just like my old clunky side tables. This is the fun part! You get to choose what to display with your furniture. This is where the real mixing and matching, making it yours part comes in to play. You don't have to put all the antique stuff in the room with the antique furniture. You don't have to put like styles together. 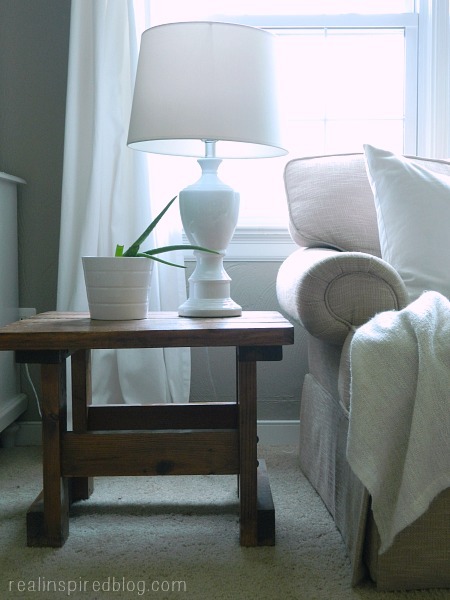 Put that shapely white porcelain lamp on that clunky 70's side table! 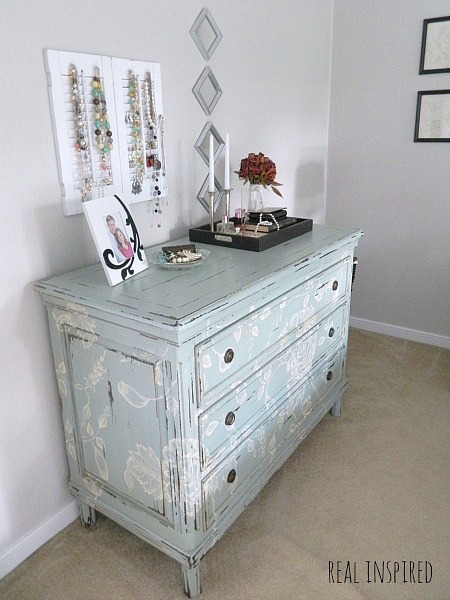 Pair that chippy painted old dresser with a modern medallion print on the bed! 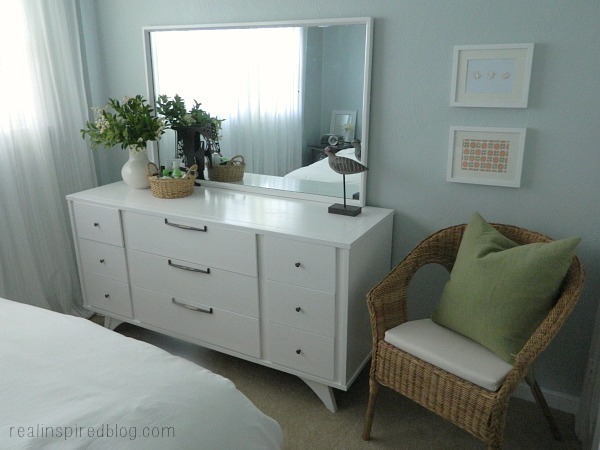 Put that wicker chair next to that mid-century modern dresser! You can do just about anything and make it work, as long as you love it and do it with confidence! Have you ever redone any old furniture? 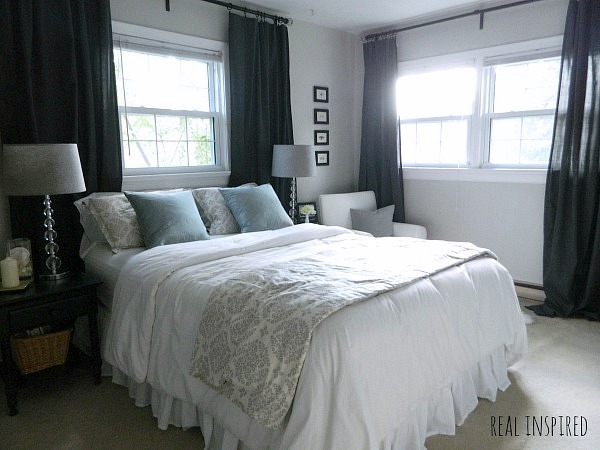 What are some ways you've mixed and matched in your home?